2×4 walnut dark travertine backsplash with brown cabinets and quartz kitchen countertop. For anyone entering the kitchen, the place that first captures your attention is the kitchen backsplash. It is for this reason that the choice of the backsplash material and designs should be thoroughly selected in order to come up with the best results possible. Travertine backsplash is one of the most ideal options when it comes to the material choice and this is due to a number of reasons. It is also important to point out that travertine tiles are also used in a number of places and projects such as flooring and countertops installation. 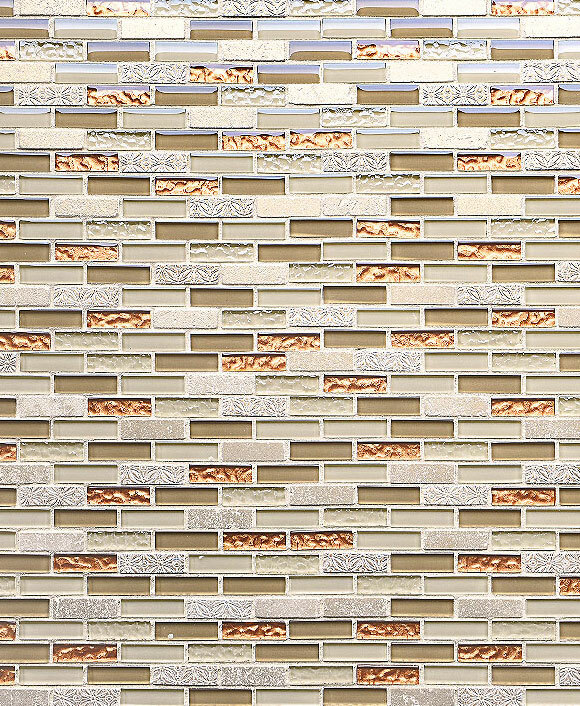 These tiles are generally known for their gorgeous look and are capable of giving your kitchen an attractive appearance. Mixed color diamond shaped travertine mosaic tile with travertine borders and medallion setting. Brown cabinet and golden color granite kitchen countertop. When it comes to the installation of travertine backsplash, the involvement of an expert is of great importance. Although the tiles are generally unique and attractive, it will be prudent to point out that they are a bit porous and therefore they should be handled with a lot of care. The travertine stone is mined in countries such as Mexico, turkey, Peru and Italy and after this they are manufactured to produce the tiles. Being a natural stone gives the tiles some advantages that are normally not present with the man-made products. 4×4 ivory travertine tile with 1×1 glass border tiles also 2×2 metal accent pieces with golden granite countertop and brown cabinets. First, travertine tiles are very hard and durable. This is one of the characteristics that one will definitely appreciate for a kitchen backsplash. Travertine backsplash also comes in a number of dazzling colors and this can be attributed to the fact that it is a natural stone. This enables the homeowner to pick from a number of easy to match colors such as deep walnut colors, cream, ivory, gray, beige, gold, and red. Travertine tiles also come in different themes which make it easy to design your kitchen well depending on your needs. If you have a small kitchen, choosing the smaller tiles will help you achieve the best results and especially when they are perfectly sealed. The tiles also come at different prices which mean they are easily affordable by different classes of homeowners. Travertine backsplash does not easily fade or discolor and instead takes a very long time no matter the conditions in the kitchen. With the ease with which it is cleaned, the backsplash can be maintained in a good condition for long. 4×4 mixed color travertine tile with brown cabinets and giallo ornamental granite kitchen countertop. 4×4 golden sienna travertine tiles, travertine custom designed medallion with brown cabinets and golden granite countertop. 4×4 ivory antique tiles and glass accent pieces with espresso cabinet and labrador antiqued granite countertop. The travertine tiles are a real deal and especially when you are looking for something aesthetic in your kitchen. With a number of pictures online, it will be easy to come up with a perfect template for use in your kitchen and therefore this should not be a difficult thing. In fact many travertine dealers normally will help their clients in designing their kitchens using some of the best high definition design tools. 4×4 ivory antiqued travertine tiles and 1×1 glass insert with white cabinets and emerald pearl granite countertop. 4×4 ivory honed travertine tile and 4×4 metal glass mixed accent pieces with modern brown cabinet and volga blue granite countertop. Travertine backsplash is available in various kinds of finishes and making a choice is therefore easy. You could opt for honed finish giving your kitchen tile a smooth and shiny appearance. The travertine themes also come in polished finish which looks like a mirror in glossiness. If you are looking for a natural look, you could also opt for a brushed finish or a tumbled finish which has deep texture. The designing process and the installation should be done properly if the best results are to be obtained. This entry was posted in BEIGE, BROWN, MOSAIC, SUBWAY, TRAVERTINE, TUMBLED HONED, YELLOW and tagged travertine and glass tile backsplash, travertine backsplash designs, travertine mosaic backsplash, travertine tile backsplash photos. 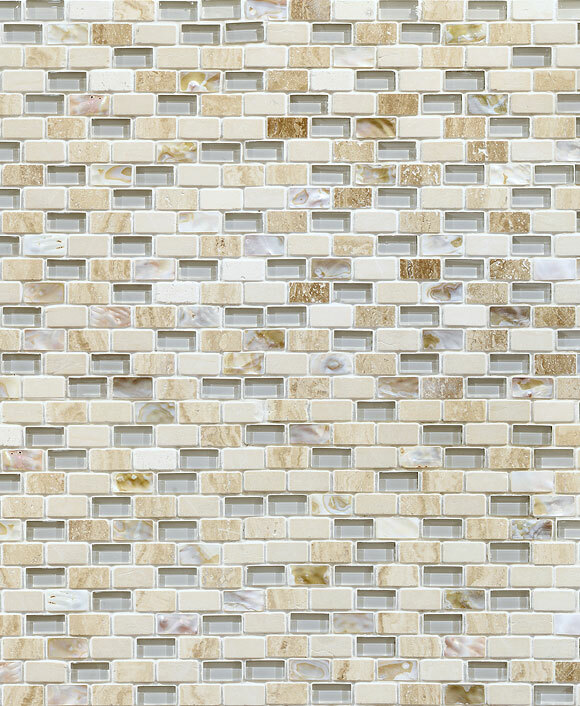 Glass travertine & shell mix backsplash tile for traditional kitchens or bathroom walls.